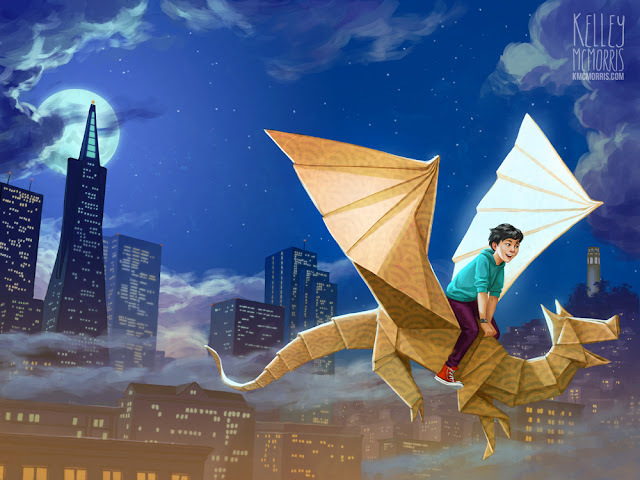 Recently during a trip to Barnes & Noble I saw some cool book cover illustrations of children riding dragons. I tried to think of how I could draw a dragon-themed book cover with my own unique spin. Pretty good considering he made that up on the spot, and was only 8 years old! 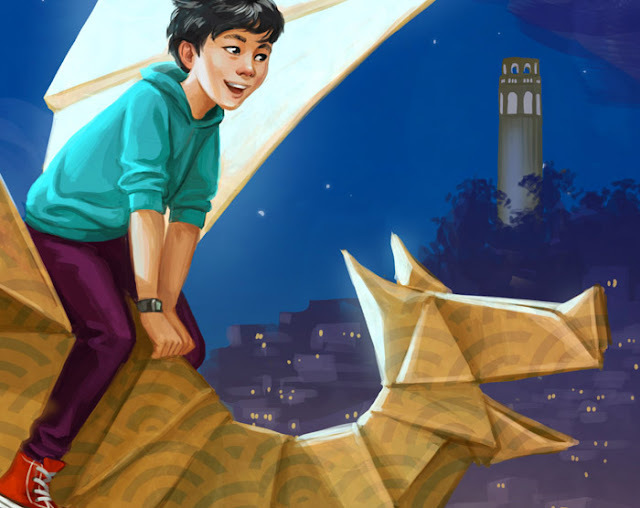 So for my flying dragon book cover, I imagined a story of a boy who can bring origami creatures to life. 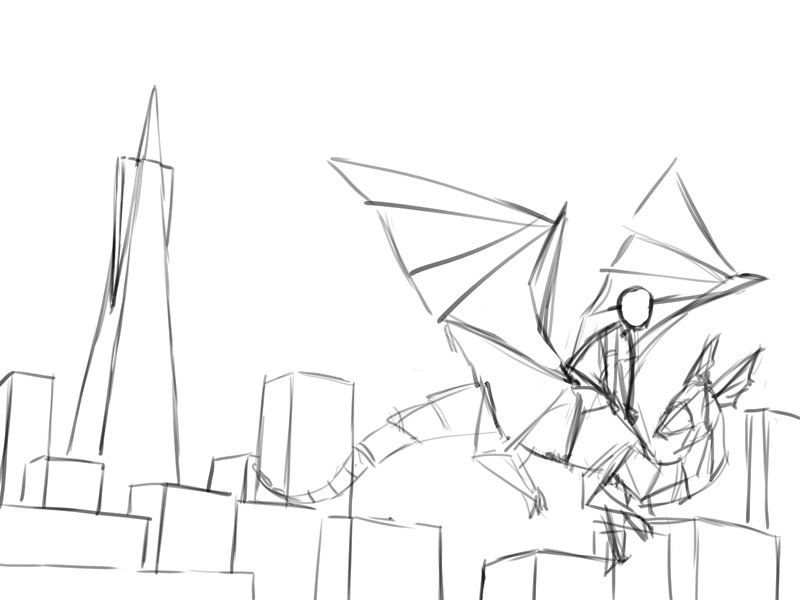 I decided to depict him flying high on an origami dragon above the city of San Francisco. Even though I've never lived in San Francisco itself, it kind of feels like home. 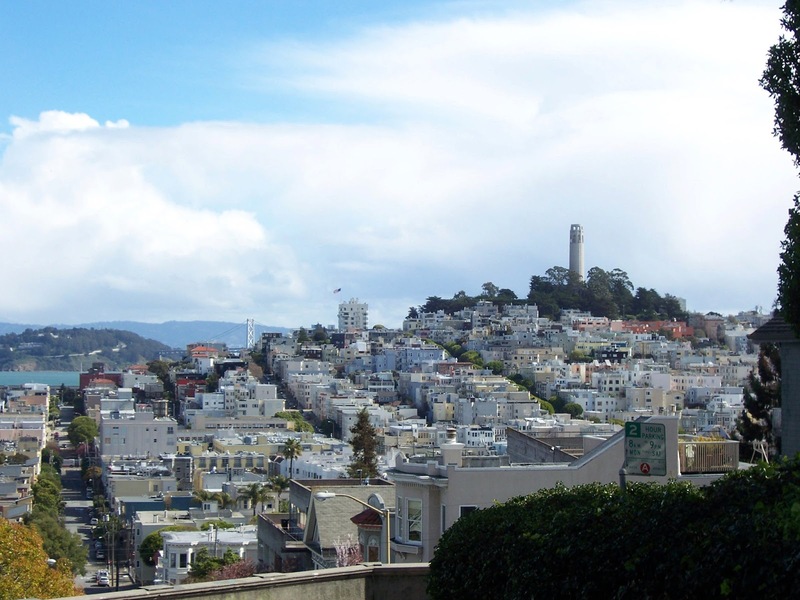 I grew up in the Bay Area, and I commuted to SF almost every day while I was attending the Academy of Art. As this gloomy Portland winter drags on and on, I've been feeling nostalgic for the California winters that defy all seasonal conventions. 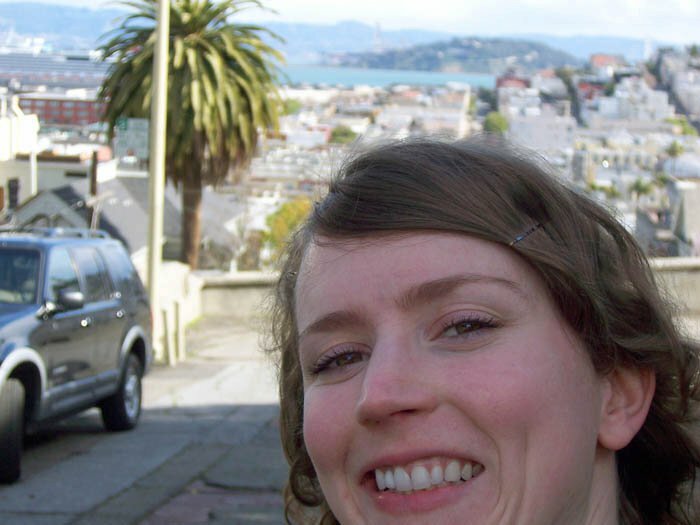 Look at these photos: I took these in February 2012. I designed this illustration as a wraparound book cover; meaning that it's designed to extend from the front of the book cover, around the spine and onto to the back. 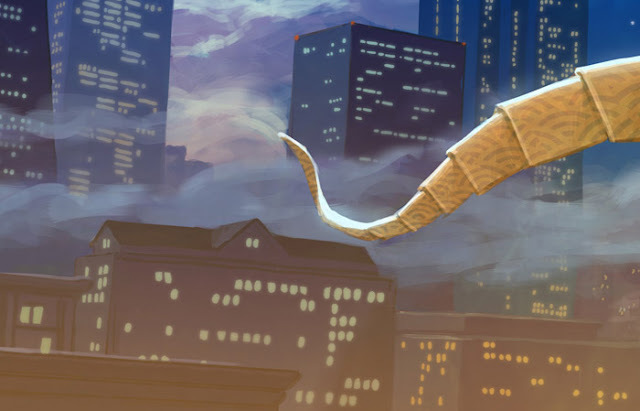 It had been a long time since I had drawn a wraparound, or anything in a horizontal format. 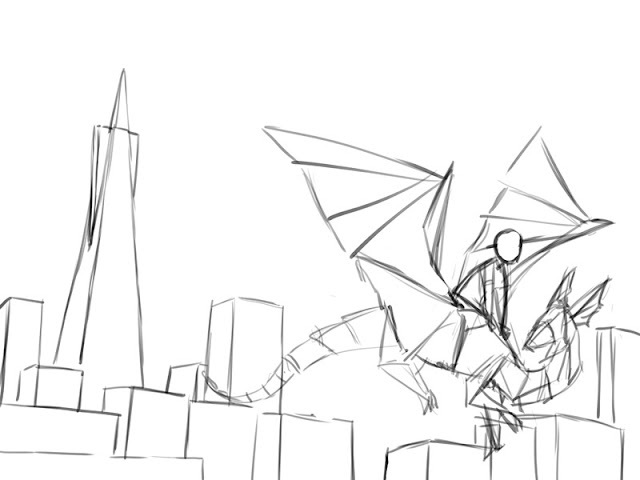 Here was my initial sketch. 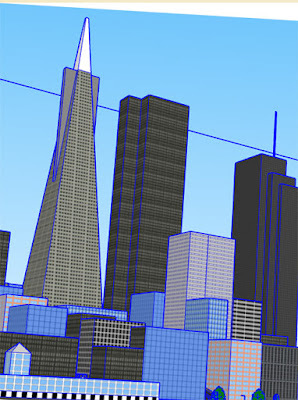 I drew the buildings with the help of a 3D model of downtown San Francisco in Google Sketchup. I wanted moonlight to be hitting the dragon's wing, so that it would frame the boy nicely and contrast with his black hair. 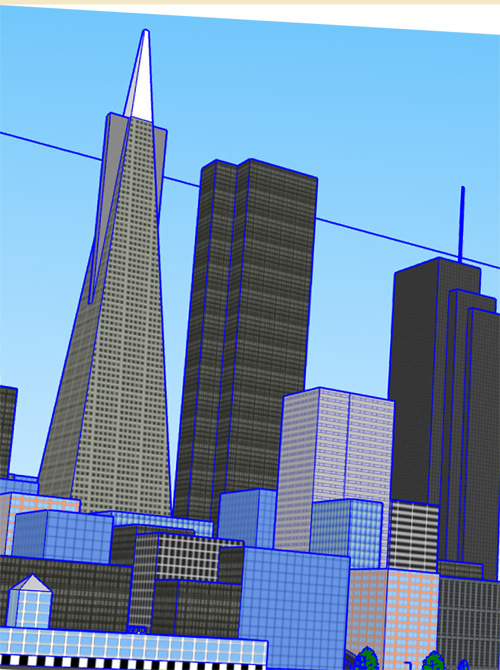 So I placed a big full moon behind the TransAmerica pyramid. Did I spend a lot of time drawing tiny city lights? Yes, yes I did. I'm sure my concept artist friends could have given me some tips on doing that more quickly, but I forgot to ask! Actually, the thing that gave me the most trouble wasn't the cityscape, but the clouds. I wanted to capture the look of San Francisco fog, and I wrestled with the clouds throughout the painting process, making them lighter, darker, thinner, thicker, cooler, warmer, etc., until I settled on something I was happy with. The design of the origami dragon is a combination of several different designs I found online. I tried not to copy any single one too closely. 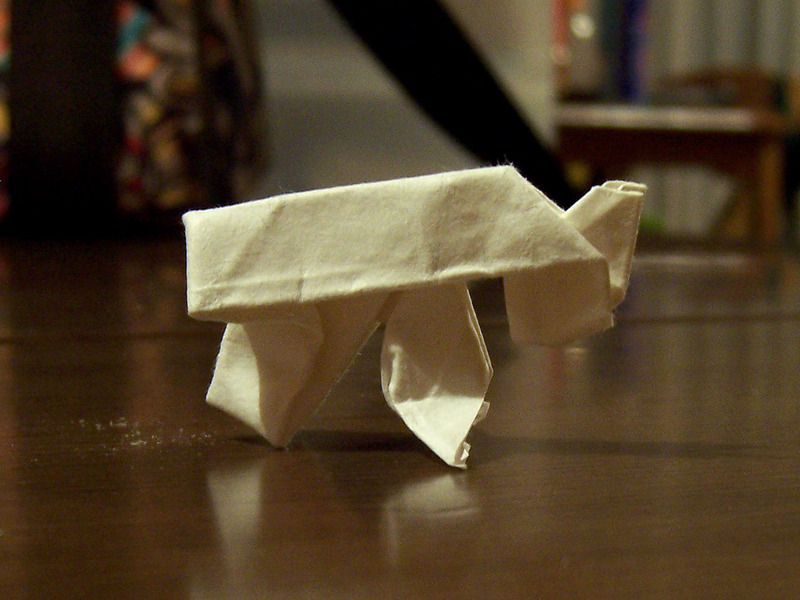 So it probably isn't feasible to fold this exact design, and origami experts could surely spot some inaccuracies. 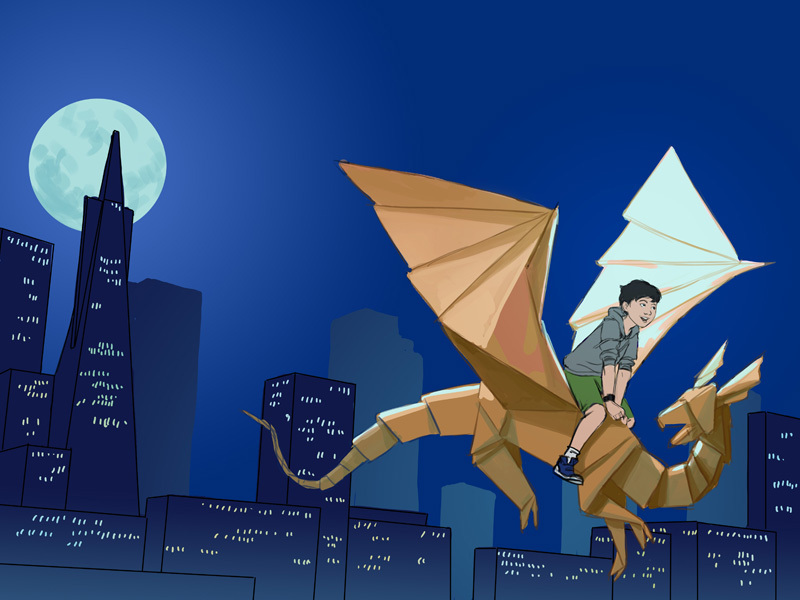 Here is the finished piece again, my host brother, riding an origami dragon, over my favorite city.